M & M Nursery has been family owned and operated since 1956. Over the last five decades, gardening trends have come and gone. Particular plants have come and gone out of fashion, too. This has shaped us into an eclectic garden center, blending the past with fun new angles. We invite you to discover the ittty-bitty world of fairy gardening. M & M’s creative director, Beverly Turner has been the trailblazer of this gardening genre since 2001. Her designs are displayed throughout the nursery to provide you with ideas and options when making your own. She has assembled an extensive collection of fairies, furniture, animals and seasonal decor – all you’ll need for a personalized masterpiece. We feature miniature plants that can be easily maintained to stay in scale with the fairy-size accessories. Our selection of mini plants includes colorful annuals, perennials, shrubs, vegetables, succulents and miniature conifers. There is a Cottage Garden Collection with rarely seen, old-fashioned flowers. Tuck them in your garden and look forward to a welcome surprise! Terrariums have made a comeback and we have plants that will thrive in them. To add the crowning touch to your outdoor rooms, choose from many styles of fountains, birdbaths and statuary. Browse the gift shop when you need that special something. 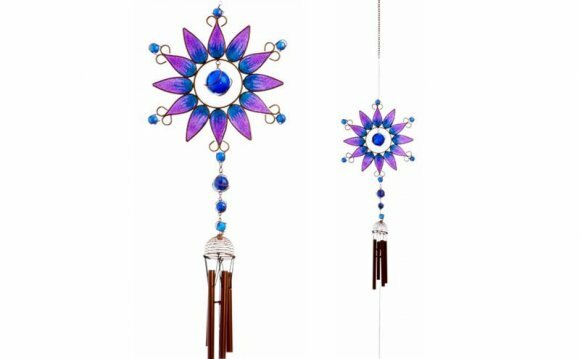 And choose from wind chimes, bird feeders, garden art and all manner of nature related keepsakes. Fairy gardening has something for everyone. Thank-you for visiting our site. Hope these tidbits have been helpful and that we’ll be meeting you soon! Beverly Turner has been fairy gardening since 2001. Long in the nursery trade, it started with doll houses. Except Beverly was more interested in designing the garden outside the dollhouse, than the interior. As Beverly began creating miniature gardens for her customers at M & M Nursery in Orange, fairies appeared. We hear they love anything small. Over the years, fairy gardening has gained in popularity with an enthusiastic crowd of fairy gardeners across the nation. And why not? Fairy gardening is the ultimate small space garden, usually grown in containers, but increasingly grown in the ground, too. Fairy gardening is something that all ages can do. A perfect project for tots trying out their hand a garden design to weathered gardeners trying something new. At a recent fairy garden contest in Costa Mesa, California, two of the top winners at a blind judging turned out to be men! Proving that everyone can bring something to the fairy garden trend. While Beverly continues to innovate and create new ideas for these miniature gardens, gardeners across the nation are trying new things, too. Take a peek at her first book “Fairy Garden – Creating your own magical miniature garden” co-authored with Julie Bawden-Davis.